Its uniqueness comes from using different hued yarns in the warp and weft during the weaving process, giving each side its own depth of color. 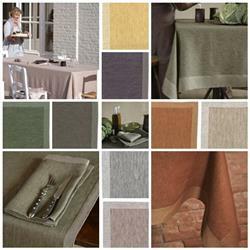 By using mitered corners to finish the table linen, the two-tone effect is shown in all its beauty. Select Table Item napkin cocktail napkins - set of 6 runner tablecloth - 69" square tablecloth - 69"x108" tablecloth - 69"x128" tablecloth - 69"x145"
tablecloths in 4 sizes and 6 colors with matching napkins and table runner. Colors: Fig, Flax, Grey, and White. Gold and Paprika colors are no longer available.